Joseph was born in Silverdale, Staffordshire in 1895 son of Benjamin Raybould and Elizabeth (nee Wrench). In 1891 and 1901 the family was still living in Staffordshire and the census indicates that Joseph had brothers John William, George and Albert and a sister named Ethel. Joseph’s father was an iron puddler who, by 1911, had moved to 10, Stone Row (Jacksdale Street), Jacksdale, with his wife Elizabeth and family to take up work in the local Codnor Park Forge. Joseph Raybould attested at Ripley, Derbyshire in February 1914. His height was noted as 5 feet 5 inches, occupation as coal miner and apparent age as 20. He enlisted on 27th August 1914 and was sent to France with the British Expeditionary Force on 1st March 1915. He was awarded a good conduct medal on 2nd January 1917. On the 31st of that month Joseph was killed in action when serving in the trenches, near Souastre, France, aged 22 years. 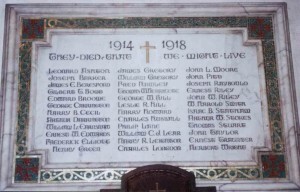 Joseph was also a recipient of the 1914-15 Star, the British War and Victory Medals which were despatched posthumously to his father Benjamin at Stone Row in 1921. In June 1917 personal effects of £11 11s 6d were sent to his father followed by a war gratuity of £11 in October 1920. Joseph is buried at Foncquevillers Military Cemetery, Pas de Calais, France in Plot III C. 1, only a few feet away from L/Sgt Harry Joseph Howard, also a 1/5th Bn Sherwood Forester, killed on the same day and buried in Plot III C 4. Both Pte Raybould and L/Sgt Howard are listed on the Jacksdale & Ironville Memorials. Foncquevillers was later adopted by the city of Derby. 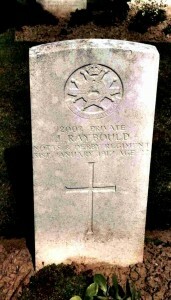 Another brother, George Raybould also served and survived. 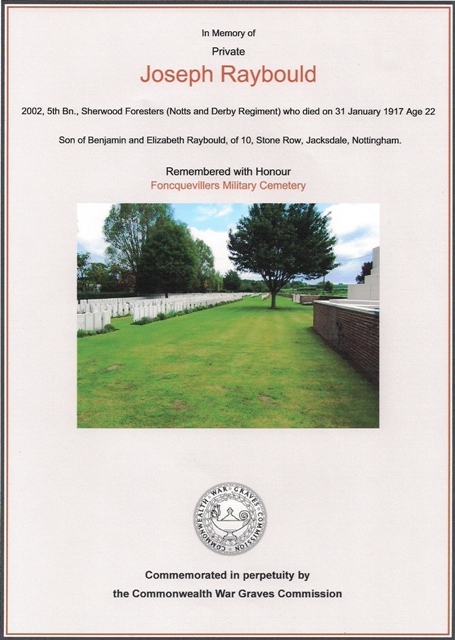 During the Summer of 2001, Judith and Terry Kelsall, of Mackworth, Derby, were kind enough to take photographs of both Joseph Raybould’s and L/Sgt Harry Howard’s graves, whilst attending the 85th Memorial Service to commemorate the special connection which exists between the village of Foncquevillers and the city of Derby.